Despite what several major-media organisations may have reported in recent months, the first astronaut to run a marathon in space was Sunita Williams. She ran the Boston Marathon in 2007 onboard the International Space Station. 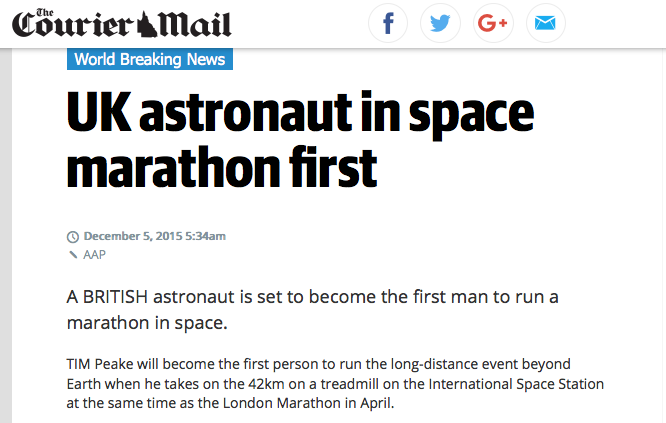 The Telegraph (UK), ITV News (UK) and the Courier Mail (Australia) all seem to think that Tim Peake will be the "first person" to do this during tomorrow's London Marathon. ITV News incorrectly claims "Tim Peake will become the first ever person to take on a marathon while in space"
The Courier Mail claims "UK astronaut in space marathon first"
Given their publication dates of these stories, I imagine that they read the Principia Mission blog, saw "Tim Peake will become the first man to run a marathon in space", and didn't appreciate that "man" was a very necessary qualifier to the statement. Converting "first man" to "first person" may be due to an unconscious assumption that men set records first. It also suggests that these stories were written by people who didn't have any relevant background knowledge or time for basic fact checking. US news outlets (including the Washington Post and Fox News) have remembered that Sunita Williams already did a marathon. Hopefully that isn't just because she is American. Good luck to Tim for the London marathon tomorrow morning. He could break Sunita Williams' current record for completing a marathon in space. This is an unexpected follow up to my last blog post about Britain's first astronaut. Our first astronaut was Helen Sharman. In 1991! I just saw an article on the Guardian website whose title is "Blast off! Why has astronaut Helen Sharman been written out of history?". That is a very good question. Although it doesn't discuss it in the article, a good example is that newspapers - including the very same one this article is from - write her out of their headlines. Remember the Guardian's "Britain's first astronaut hails 'exciting times' for UK's place in spaceflight" from 2014? 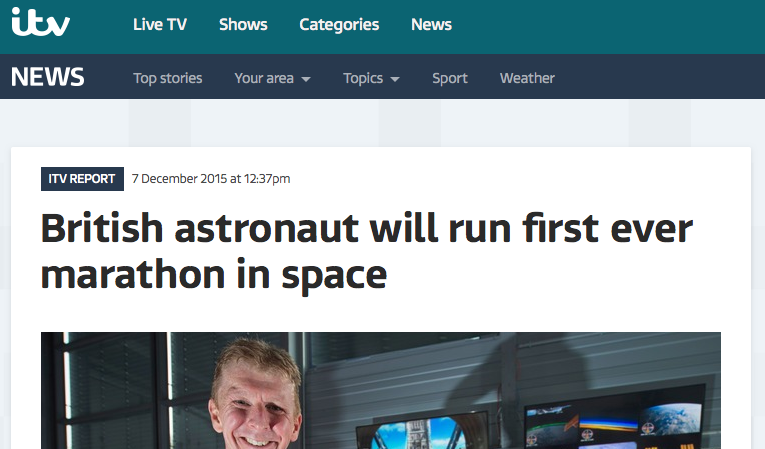 That headline was referring to Tim Peake who is the seventh British-born person in space. Of course this is how she has been written out of history, not why. To get to the answer to why, they could perhaps ask their colleagues. I'm not just a complaining person; I try to fix things too. That is why, before the launch of Tim Peake I made an effort to improve Helen Sharman's Wikipedia entry which was sparse and had a big "this is unreliable" off-putting warning at the top of it. After I made a start, others joined in and the result is, I hope, a much better article. As the seventh, British-born, astronaut was heading towards the International Space Station today, you could be mistaken for thinking he was the first British astronaut. He wasn't. He is either the second, seventh or eighth depending on how broad you want to be at defining "British". He is the first British ESA astronaut. The first British astronaut - a person travelling to space under their British nationality - was Dr Helen Sharman, from Sheffield, who went to the Mir space station in 1991. Despite the enthusiasm of various news outlets, Tim Peake is the seventh person born in the UK to go to space. Helen Sharman. Born: Sheffield. First launch: 1991-05-18. British. Supported by a private British consortium/USSR government. Michael Foale. Born: Louth. First launch: 1992-03-24. Used US citizenship. Piers Sellers. Born: Crowborough. First launch: 2002-10-07. Used US citizenship. Nicholas Patrick. Born: Saltburn-by-the-Sea. First launch: 2006-12-10. US citizenship. Gregory H. Johnson. Born: South Ruislip. First launch: 2008-03-11. US citizenship. Richard Garriot. Born: Cambridge. First launch: 2008-10-12. Dual nationality space tourist. Had a US flag on his arm but US/UK on his flight suit. Tim Peake. Born: Chicester. First launch: 2015-12-15. British. First to be supported by the UK government/ESA. There is also space tourist Mark Shuttleworth who was born in South Africa and has dual nationality. He had a South African flag on his space suit sleeve. Helen Sharman is the first British astronaut. I was a kid when she went to Mir and both her and Michael Foale were inspirations to me. Unfortunately, the press have latched on to phrases such as "Britain's first 'official' astronaut" and "Britain's first ESA astronaut" and then lost the qualifications that make those statements true. It is frustrating that this isn't just the usual suspects either. Even the broadsheets have printed wrong/incorrect/misleading headlines or reports about this. 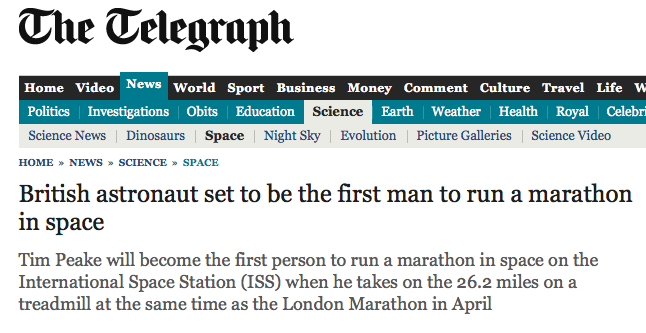 Last year the Guardian went with a title wrongly declaring Tim as "Britain's first astronaut". They add the qualifications in the first paragraph, and later mention Helen and the others, but people tend to remember the massive title text a bit more than subtleties in paragraph four. "Brits who have made the journey into space previously have only held U.S. or dual nationality and had either worked for NASA or travelled on privately funded trips". Helen did travel on a privately funded trip but isn't American and doesn't have dual nationality. Of course, if you were to ignore Helen the statement would be true. "Major Tim Peake was forced to say goodbye to his children Oliver, 4, and Thomas, 7, for six months today as he became Britain's first astronaut." He did say goodbye to his children but he didn't become Britain's first astronaut. He is our first ESA astronaut. BBC Focus magazine tweeted to wish a bon voyage to Tim but also claimed he was "our first Astronaut". Unless Tim also works for BBC Focus magazine, that's wrong. It is troubling that the person who actually was the first British astronaut gets defined away by headlines. If you wanted to omit women from the history of science this would be a way to do it. Several men who I don't know sought me out on Twitter to let me know it isn't that. Some said it was just "poor wording". Another told me that she was a "cosmonaut" not an "astronaut" despite the two meaning the same thing. Another told me there are no British astronauts as both Helen and Tim launched with the Russians so are "Russian astronauts". This perverse interpretation would presumably also have British people on an Air France flight being referred to as "French passengers". I'm not sure why so many random men have felt that need to find me and explain to me how it isn't a problem. On a more positive note, after I wrote this Brian Cox made a point of introducing Helen Sharman as Britain's first astronaut on Stargazing Live. Good on him. How many people have been to space? That all depends on your definition of space. The Earth's atmosphere doesn't have a fixed boundary. It just gets thinner and thinner. The closest to an international standard we have is an altitude of 100 km. This suspiciously round number is close to the Karman Line - a place where the speed needed for a craft to be controllable by aerodynamic forces equals the orbital speed. It is a cut-off between aeronautics and astronautics. As is often the case, the United States chooses a different definition to the rest of the world. The US prefers to use 50 miles (~80km). The practical difference from using the lower altitude is that six US Air Force pilots are then included as astronauts. I stick to 100km as it has some kind of physics-based justification. If we use 100 km, there have been 545 astronauts so far but expect that to increase in December 2015 when the next Soyuz goes up to the ISS. These comprise of 331 from the US (NASA), 120 Russians (Soviet/Roscosmos), 10 Chinese (CNSA), 9 space tourists, and 75 with other nationalities. For my recent book, I collated data on all 545 astronauts and made visualisations of various aspects. I've created a human spaceflight timeline which lets you see when every mission was as well as key moments. There are a few things that become obvious when it is presented like this. The first is how we've increased the duration of spaceflights over the years. You can see how short the Shuttle missions were (roughly 8-12 days long) compared to those on space stations such as Mir or the ISS. It is also easy to see the pauses in the human spaceflight programmes of the Soviets and the Americans following the disasters of Soyuz 11, Challenger, and Columbia. I've also created a graph of astronaut data, a map of astronaut birthplaces, a page which shows who is in space and who was in space (just change the date in the URL), and a breakdown of astronaut stats and records. As of last Thursday I am a published author (ignoring my thesis). 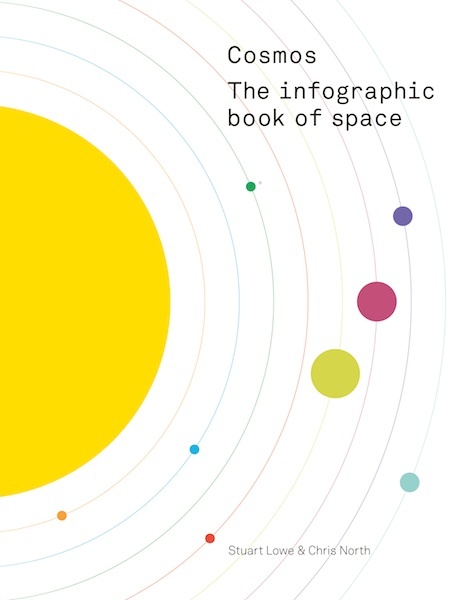 I created a book of infographics relating to space with Chris North from Cardiff University. 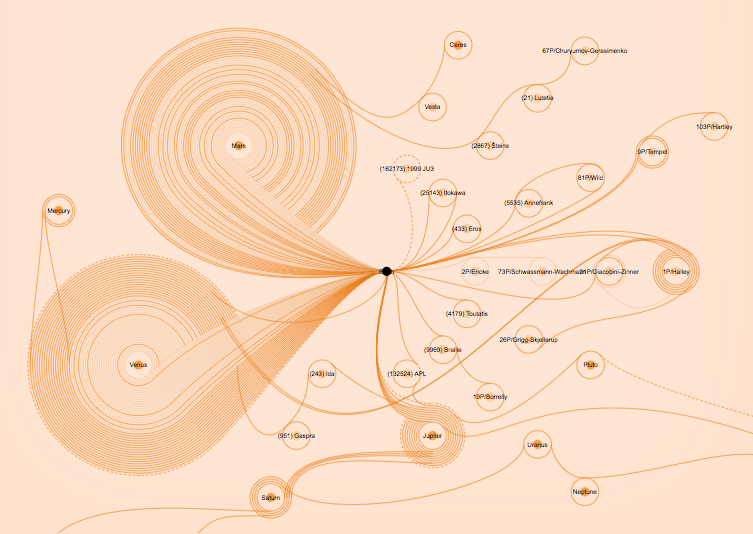 I say created, rather than wrote, as much of the effort went into creating visualisations of data and concepts. The contents start with human & robotic exploration before stepping out to the solar system, the stars, galaxies, and the universe as a whole. We have tried to include a range of concepts some of which are really easy to grasp and some which require a bit more thought. Hopefully a few challenge preconceptions (e.g. how many planets are there? and is the Sun at the centre of the Solar System?) whilst others present data in new ways (every interplanetary mission). 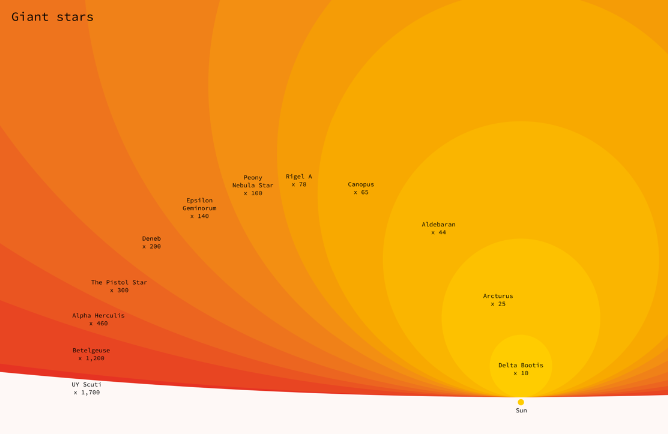 A selection of large stars shown in comparison to the Sun. We had a relatively short period of time to create the book so there was a lot of work to do. Initially we weren't sure if we'd be able to do it but managed to come up with around 60 ideas within a couple of days. The aim was 100 different graphics. As I'm based in Leeds and Chris is in Cardiff, we needed ways to work together efficiently. We used a private Github repository to build up our list of ideas and start assembling the text and data. We discussed the ideas and progress via the issues on Github and via Skype calls. But making a book needed more than just us. We had help from a graphic designer - Mark McCormick - based in Newcastle. Mark, and the other designers at his company, suggested the light colour palette for the book. They said they wanted it to stand out from all the other space-related books which tend to have black covers. I liked this idea and I think the result looks really great. We created a public repository on Github to host the web versions as well as the data sets we collated to make the book. We also decided to use the issues system to solicit corrections - there are bound to be mistakes in a book containing this much information. The website also has a few bonus infographics that aren't in the book. 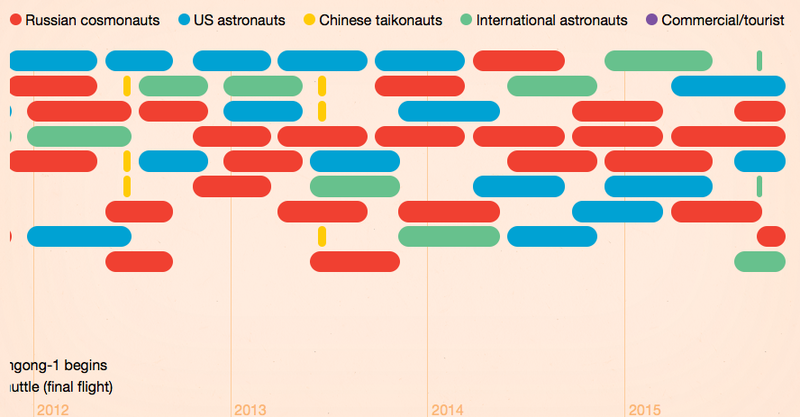 A timeline of human spaceflight missions. This is something that is just far too long to fit on the page of a book. In the end I hope we've made a well-designed coffee table book that would make a good Christmas present. I also hope we've made some interesting and useful web resources. Enjoy.